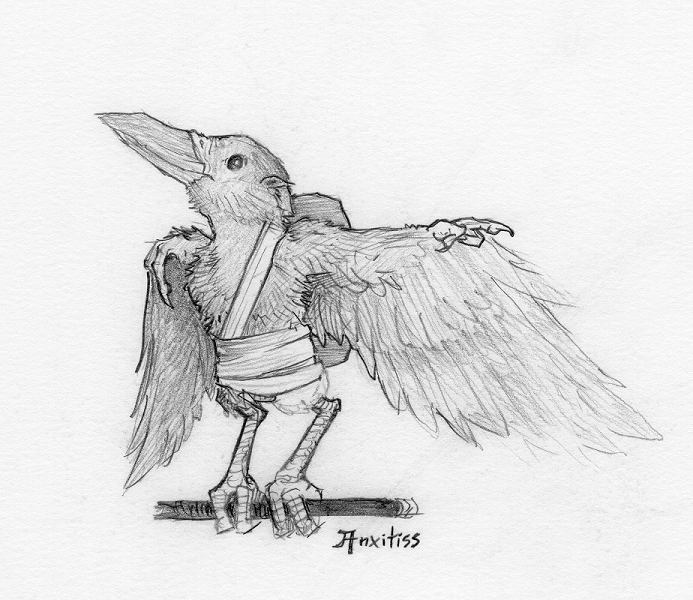 The Chrichoral are a small avian race that lives exclusively in the Aika Aitat, the high mountain peaks between the Mumattoba and Yarmir tarns. Their faces resemble ravens, crows, jays, mynahs, starlings, or oxpeckers, with various combinations of black, grey, white and blue coloration. Chrichoral wings have two clawed fingers and a thumb creating a small delicate hand, which can be used to fly, or manipulate small objects, but they cannot be used to wield most weapons. Their feet are more dexterous and stronger than a man's hands, and able to throw a javelin in flight. At 2.5 to 3.5 feet tall, they are the smallest race. Their wings span 6 to 9 feet, and they weigh somewhere between 8 and 20 lbs. They are true omnivores who eat fruit, seeds, certain fungus, insects, small vetebrates, fish, and meat. In the Aika Aitat, the Chrichoral reside in their aeries atop four mountain peaks. Their crowded, cacophonous cities contain few who aren't of their race, they are accessible only through flight or weeks of near impossible climbing. Cunning, charming, and dexterous many are thieves, scouts, and bards. They are adept at vocal mimicry and pattern recognition, with excellent memories, but short attention spans. The Chrichoral can be sarcastic, boisterous, prattling, songful, lecturing, and muttersome, but they are almost never quiet. They primarily worship Se'vensaera, their Sky of Choices, who they view as a "divine world" a goddess who is their precious realm removed from the terrestrial races. The Chrichoral consider the surface Tyrant's world, a stagnant prison. Eating carrion is something they are capable of, but only practiced by the Jajis, who have dedicated themselves to Skraosh and consume flesh for visions, spirit knowledge and other power. Chrichoral naturally distrust other species, and only deal from a position of strength and control. They generally hate combat, they communicate, they escape, they out think, they don’t fight. This comes both from their small size and hollow bones, and their culture that emphasizes superiority through outwitting and out maneuvering opponents physically and socially. Few become focused warriors or fighters, and those who do adopt a hit-and-run or ranged attack style. They favor small spears and javelins, daggers and stilettos, chakra, and "foot razors". Magic is common among their race, they have many ancient and contemporary styles, only rivaled in scope by the Fasinaa. Their mages are air elementalists, Storm Crows, summoners, Songstealers (their oldest school of magic), omen speakers, token crafters, rune scribes, Beetle Mages, illusionists, egopomps, Necrostrix, transmuters, and chaos wizards. Chrichoral are entirely uncomfortable in places where they cannot take flight, they become distressed in enclosed spaces and underground, mobility is life. Compared to the iele and the three saurian races, the Chrichoral have a very low population. Females usually lay only a single egg, so siblings are uncommon. The rare instances of "triplets" are considered fateful and blessed, particularly all male or all female sets, though the children hatched grow to be the smallest and most frail adults. They believe themselves to be the oldest race, and are thought to have been a primitive people in the age when the saurians were one, the age before the Greatest Ancients. Adolescents and young adults naturally seek to venture out into the continent to collect experiences, tricks, treasures and stories to make a name for themselves when they return. These youngsters wear few clothes/adornments and are forced to carry little to keep themselves mobile outside. Meanwhile the old birds back in the cities drape themselves in gaudy jewellery, elaborate hats, draped fabrics, and innumerable tiny tokens of bone, gem, feather, scale and gold, heavy with social importance... to Chrichoral. Back on track, 5/7 races defined: Chrichoral, Fasinaa, iele, Goboda, Shem. Only the Mororca saurians and the Umash remain.